There’s so much advice out there in magazines, movies, and television about how to win at making a great impression and who should be your wingman. Your dog can be the missing piece to killing it on your first date! What’s not to like about a furry pal who only has your best interests at heart? Victoria Schade, author of LIFE ON THE LEASH, shares with you how your dog can help you dominate the dating game. They’re a mix of audition, job interview and sharing the middle armrest on an airplane, and unless you luck into a rom com-style instant connection, things are bound to get awkward on the typical first date. But you might have the ultimate wingman ready to help make those first date jitters disappear; your dog. Your furry best friend can give you almost as much intel on your date as a dossier from a private eye, and look cuter while doing it. 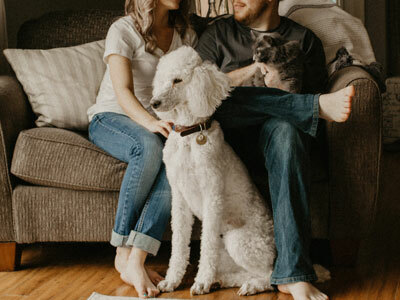 It might seem unorthodox to include your pup, but it’s worth the effort, as an evening out with your date and your dog is the ultimate personality test. If your date balks at including the heartbeat at your feet it’s your first clue that he might be a dud. But if he’s into it (as any sane human would be) plan a dog-friendly option like grabbing coffee at an outdoor café, or taking a walk in a well-populated park. Then watch your dog work her magic. Your dog will give you an immediate first impression of your date, which helps, but you’ll continue to get canine feedback throughout the evening. It’s important to note that you can’t rely solely on your dog’s initial reaction, as her history will impact her feelings. For example, if your date shows up in a fedora and your dog is wary of people in hats, her barky commentary is more about your date’s sartorial choices than his personality. (But I’d bark too if my date showed up in a fedora, so score one for Fido.) Allow your dog some time to warm up to your date, and watch how she interacts with him as the evening progresses. Keep your dog’s personality in mind as you watch her sizing up your companion. If she’s over-the-top effusive with everyone, or standoffish with new people, it’ll be more challenging to get a true read. But don’t forget to watch how your date handles her affections or reservations! Common first date advice is to watch how your partner treats service people like waiters and cab drivers, but adding your dog into the mix takes it a step farther. Obviously you want him to be kind to your dog, but this doggy dating hack goes deeper than surface-level manners. Is your date open to heavy petting, or is he more concerned with getting fur on his clothing? Does he look out for your dog’s safety, like making sure she doesn’t get to close to a busy street? Does he laugh at all the cute stuff she does? Bringing your dog on a date signals that she’s an important part of your life, and if your date doesn’t treat your dog like a part of the pack from the get-go, it might not improve down the line. Being a pet parent comes with some gross responsibilities. Middle-of-the-night vomit, drool, muddy paw prints, and of course, daily poo pick-up. But you can use the yuck-factor as yet another first date test; just feign that your poo bag dispenser is empty after your dog does her thing, and then see how your date reacts. Tell you to ignore it? One million points off. Litterers need not apply. Get creative and use twigs or an empty cup to help you dump it? You’ve got a MacGyver on your hands. Score! Offer to run into a nearby store for a bag? A dude that’s willing to go the extra mile for poo patrol is a winner. Reach into his pocket for a poo bag he just happens to have with him? This Boy Scout probably plans ahead for all of the evening’s possible outcomes. Ahem. First date not going well? Were you accidentally matched with a cat lover who lives in his mom’s basement? Once again, your dog can do the heavy lifting for you and preempt the evening. Perhaps she suddenly develops a slight limp in her front paw (“Oh, you can’t see it? It’s so obvious to me!”), or maybe it’s time for her “medication,” or perhaps it’s just that the poor dear is tired from all of the scintillating conversation and she needs to go to bed. Whichever excuse you pick, your dog can help you make a graceful – and quick – exit. So your dog loved your date, he loved her back, he passed the poo bag test and you didn’t want the evening to end? You don’t need algorithms to know when you’ve got a match made in dog-heaven. Get a second date on the books – sans pooch this time – and keep the magic going! 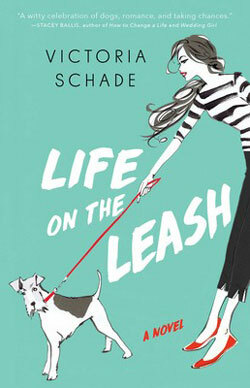 Read more about dogs and romance in LIFE ON THE LEASH by Victoria Schade! Excerpted from Life on the Leash by Victoria Schade. Copyright © 2018 by the author. Used by permission of the publisher. All rights reserved.